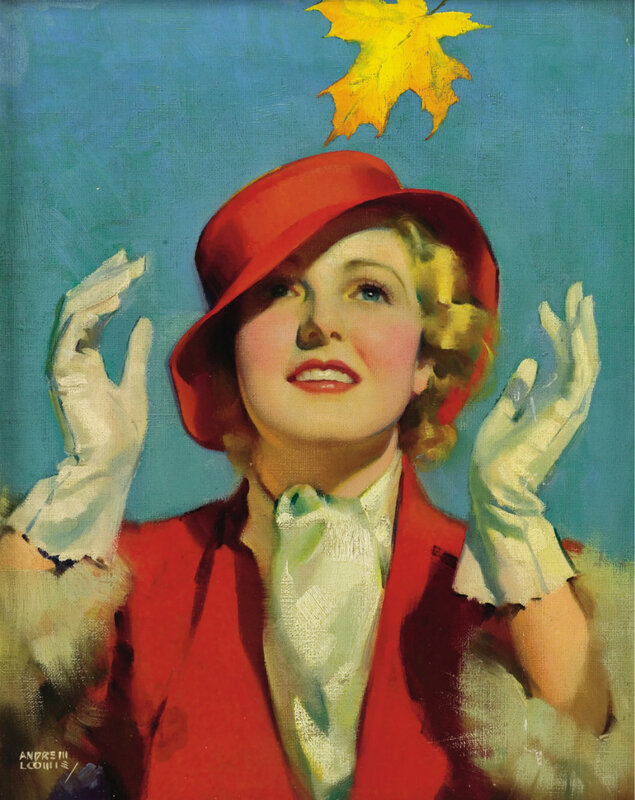 I believe this is a portrait of Jean Arthur, by a master of 20th century illustration art, Andrew Loomis. See the clear intensity of the colors? They remind me of autumn in L.A. This is one of my favorite times of year, the angle of the sun is lower, the weather is cooler. We’re deep into a drought so seeing deer coming down from the hills in the middle of the afternoon shouldn’t surprise me, but it always does. It’s time to pick avocados, and the orange trees are covered with fruit that will be ripe in time for Christmas. Next week I appear at my first book club meeting and it seems to me especially fitting that the club is mostly comprised of teachers. The fall always brings back memories of school, and one English teacher in particular. Frankly, she looked Elizabethan. Rail thin, inevitably wearing a high collared dress, the papery skin on her face always covered with the palest foundation makeup, lips carmined, hair a bright unnatural red worn in tight curls like a cap on her head. Her gaze was direct and questioning, she moved her hands sparingly, elegantly, and pointedly. She’d turn her attention toward you and ask, hands palm to palm, head cocked forward, “And what are you reading?” As if the answer were vital. I loved her for it. I’ve just finished reading, All the Light We Cannot See, by Anthony Doerr, Leave it to Psmith, by P.G. Wodehouse, and I Look Divine by Christopher Coe, with an introduction by David Leavitt. All the Light takes place in WWII, the world is broken; but the lives of two children—one blind and seeking, one gifted but schooled by monsters—merge with startling beauty. Leave it to Psmith is pure Wodehouse fun, a comedy of manners set in Blandings Castle, where jewels go missing, and mates are found. I Look Divine is a portrait drawn with a diamond edge by an author who died of AIDS in 1994. The high life of two brothers is recounted by the elder, who lives to see the younger feed on the desire of other men, and self-destruct at the first hint of age. Okay. Really different stories, but what these books have in common is the divine clarity of the author’s prose. Beautifully, beautifully, written books. I ought to ask my husband. His mother worked mainly in pastels. It’s hard to imagine those eyes could be done with pastels, but what do I know! Such amazing use of colour. Love Jean Arthur and although it doesn’t really look like her, it is a wonderful illustration. I went immediately to Amazon to put All the Light We Cannot See on my wish list only to find it’s already there! I’m currently trudging through Lulu in Marrakech by Diane Johnson (Le Divorce etc). I’ve not read her before. I want to know what’s going to happen but the heroine’s interior life is boring me to tears. This is a beautiful illustration and looking very closely, the “tooth” of the surface appears to be canvas and the blue above her right hand appears to be brush strokes! That implies oil paint – but the drying time of oils implies that it was not a quick deadline! Unlike several of my Over-Nighters! A delightful post, Ms Lester. I am sure there will be much wowing and knocking off of socks at the book club! I adore the description of your tutor. Recently, I been reading To Say Nothing of the Dog, an extremely witty and imaginative novel by Connie Willis which I received as a gift from a lady of taste and distinction! It is very funny, a farcical time travel about a character suffering from “timelag” who finds himself sent back the England of Three Men In A Boat whilst not in his right mind to prevent a destructive paradox, romance and shenanigans follow. Wodehouse and Wilde are pronounced influences, also; there is a domineering character from the future named Lady Schrapnell, who wishes to build a perfect replica of pre-WWII Coventry Cathedral and rides roughshod over all! The image to this post is divine! Wodehouse, Wilde, and Willis—sign me up! To discuss my book…it’s kind of a funny thought. Since they’re teachers I’m wondering if they are going to ask more questions about the writing process, or…? I’ll find out and report back 😉 . I love history and am reading Stephen Ambrose’s account of the Lewis and Clark Expedition, Undaunted Courage. They’ve finally reached the Pacific!!! It really is amazing how they got over those Bitterroot Mountains, and only one man on the entire trip died-illness laid him low. Jefferson had a wacky idea to gather all the tribes west of the Mississippi into one land area and train them to farm, be good trading partners(consumers) and as they met different tribes, Lewis, from his journals, could tell just how “wacky” Jefferson’s idea was. I read that book by Philbrick 3 years ago. Good read but haunting for all that they had to endure to survive, heartbreaking, too. “The Wind-Up Girl” by Paolo Bacigalupi. Bacigalupi means “kiss of the wolf”, in case anyone is interested. If I ever change my last name, it will be to Bacigalupi. Such a beautiful woman and colourful painting. Just finished the “Incredible Lives of Greta Wells;” lovely. My hairdresser made an interesting observation a few months ago. She said that people always look better in the late summer/fall. Here, in our northern climate, everyone looks rather pasty after the winter months, but she talked out the lovely colours everyone’s skin has in the autumn. I had never really thought about that before but, as the summer and fall progressed, I saw that she was right. Re-reading Psmith in the City, the n-th time!